Our Premium 36-pc racks (4 Rows) will impress all your guests! 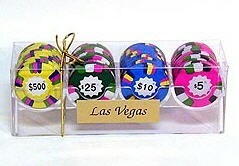 There is nothing like 36 beautiful foiled chocolate casino chips in a clear box with a gold stretch bow. Price per rack is below. IF YOU WANT MORE THAN ONE DENOMINATION, LET US KNOW YOUR SELECTION IN THE "SPECIAL INSTRUCTIONS" SECTION.